AJP is a specialist in water or solvent based coating films and papers. Being present for over 25 years in this sector, we possess an in- depth to meet all needs, with thickness ranging from 12 to 350μ and maximum width 1620 mm. We support your company in the development of your products. Our chemists continue to develop ink-retainable coatings that ensure perfect drying and brightness suitable for your printing. Prior to the final production, all tests and pre-industrial tests are performed in our laboratory. Our quality control checks the weights of the coating layer (from 1 to 27 g), the surface homogeneity and intrinsic qualities of the final product. Our massive investments in the processing of solvents ensure we are an environment friendly company. Special coating (varnish, glue, etc.) upon request. 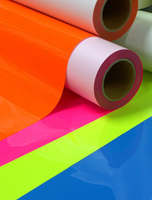 Printing materials for flexography printing, heliography printing, screen printing and offset UV printing. – AJP films are treated so as possess stability, adhesion and printability. – AJP is highly flexible and can meet your requests to produce a glossy, matt, white or opaque finish. The quality of your final product is therefore optimized to live up to your expectations. – Our materials are suitable for numerous needs in all industries, such as heat resistant label printers, coatings for leather and textiles, technical printing media, thermofoil paper for the food industry, roof-top lining, fluorescent posters for retailers, etc.